1- The job market is so much harder then you think. Most jobs you see you’re either going to be grossly overqualified or under-qualified. Only go to college if you have a clear path where that degree will take you. Focus on learning as much as you can and do things that will help your future. 2- Not everyone you meet is going to be as kind as you. Not everyone will be the kind of friend you are. Don’t waste your energy with those people. Surround yourself with people who care about you through the good and the bad. Find people who understand you or at least empathize with you. Appreciate your loved ones and the ones who take care of you. 3- Take care of yourself first. Mentally, physically, emotionally, socially, financially or intellectually. Don’t put someone else in front of your own care. Take care of your body and your mind. Be active as often as you can. Eat in moderation but still enjoy what you like! Always put yourself first. You can’t help others if you’re sick or drained. 4- It’s okay to struggle. It’s okay to ask for help. Just make sure you’re going to the right people (see #2) Make sure you periodically have time to vent and let things out. Cry if you need to. Take a sick day if you need to. Keep the communication open with your supporters. They can’t help you if they don’t know. 5- DONT BE SO HARD ON YOURSELF!!! Be yourself. Don’t try to fit into society’s mold of what’s expected. Don’t do things that don’t contribute to your wellbeing or happiness. Continue to be gentle with yourself. Understand that you can’t always be perfect. Accept that you are the only version of you there is and don’t try to be someone else. so this blog has always been about fitness because fitness has always been a part of me. but I think I’m ready to take it in a new direction. After putting my body through one of the most extreme and dangerous situations I’ve realized that I need to take a step back and learn to appreciate my body for what it is. the pictures you see below are a sort of reverse transformation. The first is when I just moved back home from college. I had just started working out and counting my macros religiously. It was new, it was fun and I was seeing results I had never gotten before. 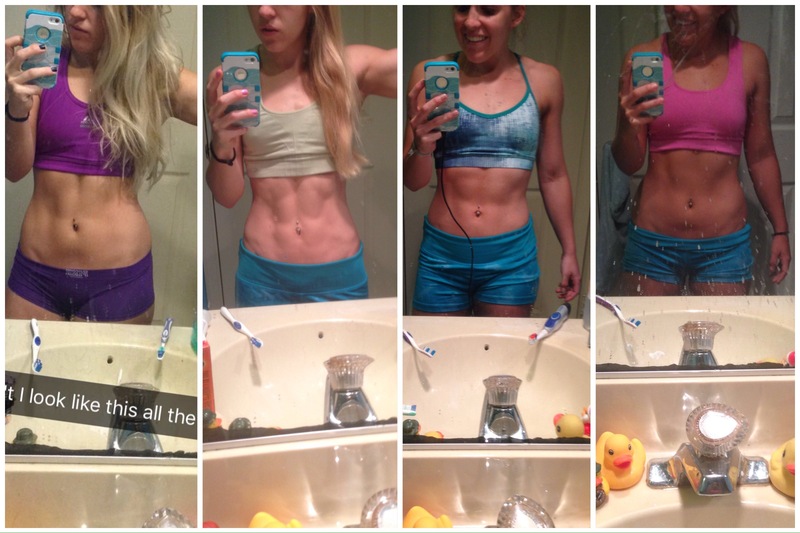 I had fallen in love with lifting and naturally dieting came along with it. This is the last time I remember actually liking the way I looked AND felt. The second is days before my last bikini competition. I was 100 pounds. I was starving myself, eating way too little and exhausting my body. and for what? to win some trophy for some organization who doesn’t even care about my well being? for months I slaved over EVERYTHING I ate. I exercised about 2 hours everyday. I became obsessed with food with exercise. I lost friends, I lost a social life, I lost my ability to have a normal relationship with food. Fast forward to the third picture. that was about 2 weeks after my competition. 2 weeks of binge eating and out of control dangerous habits. I had no sense of what to do around food. some days I ate nothing for hours & then binged on absurd amounts of food. I was so anxious ALL THE TIME. I was still living a nightmare. I didn’t know how to regulate myself normally anymore. I was so out of touch with my body and my signals. my body was literally STARVING and asking for food, it was trying to help me live yet I still fought it. I felt disgusting and anxious every second of the day. I was still working out 1.5-2 hours a day. I was terrified to leave for a 5 week vacation to Europe. How would I monitor myself? How would I not balloon up? I was extremely anxious and honestly didn’t even want to go. but guess what? that trip to Europe was the first stepping stone to my recovery.